REL’s subwoofer isn’t for the big boomers, but will subtly augment the sound of systems in smaller rooms, writes Ashley Kramer. SUBWOOFERS ARE A bit of a conundrum. They’re totally accepted and even loved in the home theatre environment, but somewhat scorned in stereo environments by much of the audiophile community. The theory of a subwoofer in a stereo system is sound, because low bass is probably the most difficult part of the frequency spectrum to generate properly (unless you have big speakers, and even then, the results are by no means assured) and subwoofers are nothing if not low bass generators. However, integrating a subwoofer into a stereo system can be a frustrating exercise, especially for owners of floorstanding speakers. Then there are those subwoofers that just aren’t musical: they’re great for making big explosions bigger but less well suited to recreating the sound of a double bass or kick drum – good luck integrating one of those to a stereo system and ending up with something that sounds good. 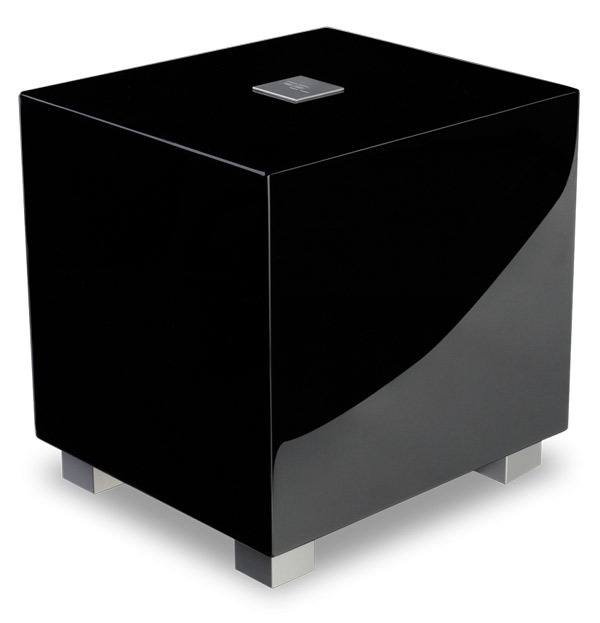 REL is a British company that’s dedicated to making subwoofers, but not just any subwoofers. The company is into good subwoofers, the kind that are intended to make music, not go boom. So REL products are engineered for integration into stereo systems. Presented with the opportunity to review one of the T-Series units, I jumped at the chance because I’m the proud owner of a five box amplification system that’s expressly been designed to work in a 2.1 layout. The designer of my amps is Franco Viganoni, a man who’s utterly convinced that bass can only be properly generated by a good subwoofer from a specific brand (Audio Pro, if you must know), and as much as he’d frown on the idea of another brand of sub being used with his amps, the little T-Zero was an intriguing concept that begged for a listen. The T-Zero is the baby of the T-Series, and baby is an apt term because as far as subs go, this thing is tiny. At 216 x 241 x 260 mm (W x H x D) including the feet, the T-Zero doesn’t exactly strike one as the kind of unit you’d use to get down low, but it certainly impresses from a looks perspective. The gloss surface is gorgeous! It’s finished in nine coats of hand rubbed black (or white) piano gloss lacquer, further polished on a rouging wheel using jewellery buffing compound and then hand polishing using micro fiber cloth and automotive waxes. The T-Zero is fitted with aluminium feet with a matching badge on top, and even the bolts holding on the control panel are the polished T-304 stainless steel type – this little sub is beautifully put together, especially considering the price. The compact form factor obviously means that the huge drivers usually associated with subwoofers just aren’t feasible, so REL has implemented a single 6.5-inch (165mm) long-throw downward firing driver housed in a sealed cabinet and driven by 100 watts of Class D amplification. The cabinet is described as being “super stiff” and designed to drive up the resonant frequency to allow the damping of the “instrument-grade bracing” to be more effective. It’s reasonably dead and dull when given a scientific hard knock with a calibrated knuckle, but that’s not too difficult to pull off when the longest edge of your cabinet is less than 300mm long. Bottom end extension is limited (as expected) with REL claiming a modest 38 Hz at -6dB in room. That’s not really subwoofer territory according to most people, especially the aforementioned Mr Viganoni, who reckons a sub needs to be able to get to 20Hz at -3dB. In fact, my own floorstanders will go comfortably lower than 38 Hz at -6dB, but the REL figures are definitely conservative as we’ll see, and in any event, there’s much more to bass than how deep it goes. 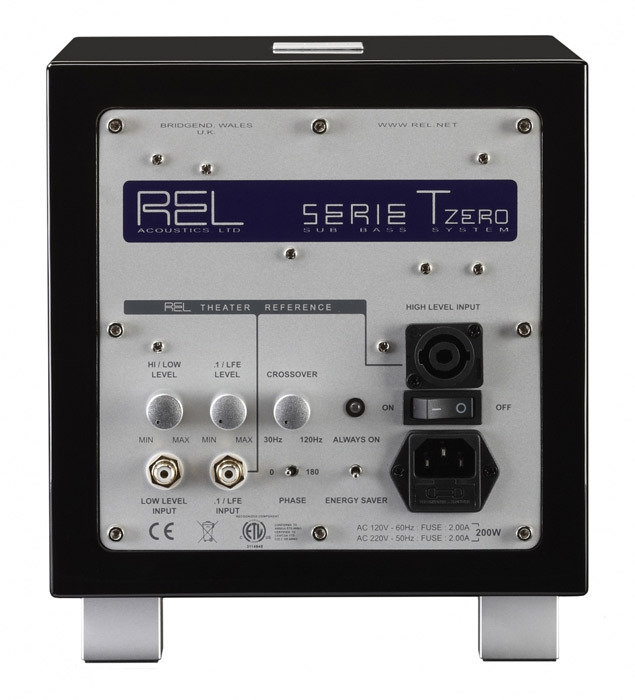 Before getting negative about the T-Zero’s dimensions and extension, let’s remember that it’s intended to be used in smaller rooms with reasonably modest stereo systems and also to allow REL’s products to be available at a much more reasonable price point. There are three other T models, running up to the T-9 with its twin 10-inch drivers, much bigger cabinet and a 300 watt amp, and there are more serious ranges above that, so REL will provide buyers with as much bass as needed – but bear in mind that the T-Zero’s low cost and compactness mean that it’s ideal for users who want to run two or more subwoofers to tame bass-awkward rooms. When it comes to hooking up the T-Zero, users will find that REL takes a different approach to many subwoofer manufacturers. Instead of the default option of a RCA LFE input found on most subs, REL prefers to use a high-level (speaker level) input in a hi-fi environment. In fact, the very comprehensive manual states: “ALWAYS connect using the REL HIGH-LEVEL input, unless your system simply cannot accommodate this”. There’s method to this seeming madness, according to REL: “The purpose of connecting to the speaker output terminals is one of the unique secrets of REL’s success. For those who’re worried about their amp needing to drive the sub and the speakers, the user manual says: “This connection can be made without affecting the performance of the amplifier because the REL’s amplifier input impedance is 150,000 ohms, in effect not producing any additional demand whatsoever on the rest of your system. A LFE input is also provided, and the speaker level and the LFE input can be run simultaneously and set up differently with their own controls to allow users to effectively have a “hi-fi sub” and a “home theatre sub”. The rear panel is host to more or less the usual sub controls and inputs – with a low level input plus the LFE and high level speaker input. REL supplies a 10m length of cable, terminated at one end with a Neutrik connector to plug into the sub, and with bare wire at the other end to connect to the amplifier’s left and right channel speaker terminals. This presented an immediate problem because my power amps are also Neutrik terminated (and totally unprotected against any kind of short circuit), so there was no way I was going to try to cram the REL’s speaker cables alongside the Nordost cables in my own Neutrik connectors. Fortunately, with my amplification chain there are a number of ways to connect a sub, expressly intended to roll off the signal sent to the main speakers, allowing them to do what they do best (upper bass upwards) and passing the full signal to the sub, thereby allowing it to do its job and recreate the low bass. Having heard how good this set up can sound, it seemed the logical approach, and in this case, I used the cut inputs on the power amps to feed them a rolled off signal and ran RCA interconnects into the sub – combined with an adapter into its low level input. In a word – impressive. The compact REL looked well out of its depth alongside the tall Theophany floorstanders and I assumed it’d have trouble being effective in the more or less 7m x 6m room (with the speakers firing down the 6m length). So I cranked up the crossover and level knobs only to be greeted by a profoundly overblown low bass, even with the speakers now being rolled off at the bottom. Despite the comparatively small driver and cabinet, the T-Zero can move a fair amount of air, but it doesn’t like to be driven outside its comfort zone. Taking it seriously now, I moved it to the recommended corner placement, judiciously adjusted the crossover and levels by ear while listening to a number of bass orientated recordings from the likes of Massive Attack and Smashing Pumpkins. Half an hour of this got me to a balance that seemed to match seamlessly with the speaker’s upper bass. Lo and behold, exactly as promised by the Viganoni theory, the midrange was clearer and the bass seemed slightly more articulate. Bass extension didn’t seem to be dramatically deeper than that produced by the speakers when they’re running full-range, even with the promised 9dB of acoustic amplification delivered by the corner loading – the laws of physics can only be helped along to a certain limited degree. However, the sub integrated with the room better than the speakers do, creating fewer high pressure bass nodes. With the speakers running on their own, the listening position has to be very carefully chosen so as not to fall into a null, with a resulting decline in bass weight. With the REL in place, there was a more even front-to-back distribution of bass. The cleaner midrange and better overall bass quality came as no surprise, because I’ve indulged in this experiment before. A few years back, I bought an Audio Pro sub at a liquidation sale. Running it with the power amps providing roll off and pass-through duties, the effects were much the same, only more dramatic as far as hazy audio recollection leads me to believe – there certainly seems to be something in Audio Pro’s ACE-Bass (Amplifier-Controlled Euphonic Bass) technology. The T-Zero was left in-situ for a fairly long review period and at no stage did I feel it had provided any detrimental effects to the audio performance of my hi-hi system. Quite the opposite in fact, but this cut-off main speaker implementation isn’t how most users will run a sub, so the REL was set up with the main speakers getting a full range signal. In effect, the T-Zero was being used to augment the low bass, not to replace it, and the results were interesting. The midrange benefits vanished as expected, but what was surprising was just how easy it was to get the REL to integrate with the system. What can be a mighty pain, was more or less a simple matter of dialling down the sub to get its contribution to subtly add to the bottom end of the speakers without creating too much of a bass peak. Of course, there’ll be some combining of output of the two bass systems and this is usually what causes problems when trying to get a sub to work in a system with bigger speakers; it’s much easier with speakers that aren’t quite as bass capable. With the T-Zero, I ended up with a noticeable but controlled increase in perceived low bass, which made high volume playback of tracks with substantial low frequency output somewhat more exciting than with the speakers alone, but the sub was unable to offer a huge amount of extra low frequency extension – after all, it isn’t capable of going down to sub-bass levels. The T-Zero didn’t slow the bass down at all, proving easily able to keep up with the speakers in terms of timing. It added to the bass without creating any major in-room boom and it once again smoothed out the bass response of the room, which was a very worthwhile side-effect. The ability to fit in with rolled off speaker environments or smaller speakers – which is its natural habitat – and to be able to delicately augment a set of bigger floorstanders, is due to the T-Zero’s ability to provide just enough bass for the job at hand, without getting carried away. That’s due to design and size, but of course its limited extension means that you wouldn’t use it to add bass to a set of speakers that reach way down low already. Franco would no doubt argue that even the biggest speakers still need to be rolled off because their low bass is probably a distortion-laden nightmare, but at that point, you’d need a much bigger sub. Never heard these before. But your review makes me think they may be worth a shot. Going for a higher end model would be my choice though. They would be laking for my needs a little. Thanks for teh great review. Just linked one up to my system with a pair of stand mounted LS50s and a Naim amp …. always thought the bottom end lacked some punch although the mid and highs are very sweet. Very impressed so far, the little Rel has no problem integrating into the sound stage and after a few minutes tweaking with the levels all is very pleasant. If you want a small extension to the bass response of a system like this you could certainly do worse than this little job. Just bought two of these to match my B&W 685 s2. Glad I read this review it sounds great, they are such a powerful little subwoofer! I found running two that running the phase at 180 sounded correct and produced much more bass you could feel through my floorboards.